Welcome to Enersol’s web site, a celebration of Enersol’s unique contribution to the global transition to sustainable energy! Through this site, Enersol wishes to share its experience and its message of hope with others around the world. Enersol had humble beginnings. Following a mainstream career in the energy industry with Westinghouse Electric Corporation, at age 29 I listened to my heart and dared to follow my dreams. 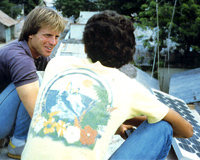 On January 21, 1984, I boarded a plane from Boston headed for the Dominican Republic with a solar photovoltaic panel under my arm, combining my interest in Latin America and renewable energy. First, I demonstrated the technology to rural families. This resulted in the first installation of an appropriate solar PV system combined with a micro-credit payment plan, sold to Sr. Felipe Martinez in April 1984 for his country store/home in the community of Bella Vista. Soon, as word spread, many other families and businesses in Bella Vista and other communities expressed interest. With such positive response to this innovation, after my return to Massachusetts on September 27, 1984 I incorporated Enersol Associates, Inc. a non-profit organization with a mission to introduce solar technology to the region. Thus Enersol’s incredible journey began. Enersol created great interest. It was as if Enersol was an oasis that appeared in the desert to quench the thirst that so many had for practical rural energy solutions. Many wonderful people helped Enersol develop and grow. 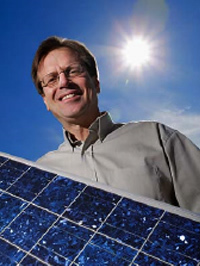 Phil Covell, who first joined Enersol in the summer of 1986 as an intern from the School for International Training, essentially became a co-founder of the organization. Other people became involved with Enersol as well, many of them as students or volunteers with the US Peace Corps. We were visited by people from several of the energy laboratories of the United States Department of Energy. Bi-lateral organizations such as USAID and GTZ began to seek Enersol’s leading-edge knowledge, and multilateral institutions such as the World Bank drew from Enersol’s work to collect “best practices” for creating PV projects in the Asian region. Although Enersol completed its mission and wound down its activity in 2008, it is a pleasure to know that the impact of Enersol’s work lives on through the many people and institutions around the world that were influenced by the pioneering and catalytic role it played in the rural energy sector. It is also very satisfying to know how much the quality of life has been improved for millions of people in rural villages. Transition Consulting did around the world to support solar entrepreneurs. On this web site there is much more information available about Enersol’s programs and history, along with valuable links and resources. So I welcome you to explore Enersol’s “legacy” here, to learn about our experiences with the use of solar technology in Latin America. I am certain you will find hope and inspiration in the process.